BitCoin Mining Is Here – What Does It Mean For Our Town? A few weeks ago a concerned resident rang my doorbell. She wanted to ask if I knew anything about a Bit Coin Mining operation that has been setup on the property of one Grand Forks business not that far away from both her and our residence. It was news to me . . .
Once she was aware of it she found that the droning sound of the cooling fans (there would be a lot of them) was inescapable. She did some research online about these operations and what she found was troubling. So she decided to go further and get local media (me in this case) aware. I talked with her and suggested that she should bring this to city council’s attention by either appearing as a delegation or sending in a letter as an information item. During the next meeting (the only one in July) I saw this wasn’t on either agenda so I decided I’d bring it up in the Committee Of The Whole myself. In case you didn’t already know ‘bit coin mining’ entails using fast computers to solve tricky mathematical problems. Those who have faster and more computers can do it quicker and the quickest are the only ones that actual make ‘money’. Fast computers take more electricity and generate more waste heat which necessitates cooling which takes more electricity. Multiply this by dozens or hundreds or thousands and you’ve got an idea of what a bit coin mine requires. These operations are being setup in rural and industrial locations where they have some privacy, low taxes and access to commercial / industrial electrical systems. A medium operation will use more electricity that the town it is located within or near. More than one increases the draw on the power system. The utilities that supply the power find themselves in a pinch: they have to either upgrade OR buy the needed power on the spot market OR both. That drives the rates for all their customers up. Some might remember that a few years back we saw the rise of gasoline derived from plant sources – specifically corn. This created a situation where corn producers had to choose between selling their produce to gas tanks or stomachs. Guess which pays more and guess what happens to the price of that commodity? So now it’s electricity and the choice is between people and machines. But will there even be a choice? A short while ago I watched as some on council fumed over the impact of a Tim Horton’s Drive Thru on the traffic in the block or so around it’s proposed location downtown. It was pointed out that (1) the time to ban drive-thru’s was before the first one ever happened and that is long past (2) the city has no real say in the location because it is on private property and the Ministry of Highways says its okay because there’s no road access issues for them. It isn’t the first thing I’ve seen where council finds themselves being reactive because previous councils weren’t proactive in their forward vision and planning. And it’s not the only big thing coming from the world at large that impacts our little town. So I suggested to council (the video below starts at this point) that they should get proactive, study the available information and start making plans about zoning and impacts and how to mitigate those before they happen. Because it would only take a few people flush with a lot of cash from the sale of their property in the lower mainland to move here and set themselves up with a nice little earner (bit coin mine) for their retirement to upset our town. And with the recent flood and possibility of a large scale buyout in the area right next to the electrical switching yard in North Ruckle the stage is set for them. This entry was posted in City and tagged bitcoin, electricity, mining on August 9, 2018 by gftvboss. This week (Aug 7-10) there were a number of meetings held by the Flood Recovery Team. Just as the receding of flood waters reveals the rocks and debris from the disaster these post-flood-data-gathering meetings are exposing the hard choices the city needs to make for its future safety and existence. First the residents of each affected area got meetings that were closed to everyone but them. The two meetings with North and South Ruckle residents happened at GFSS, the meeting with downtown businesses was in the Gazette office. Where the meting with Johnson Flats’ residents took place I do not know. In previous meetings there was a sense of unanswered questions and amorphous plans. These new meetings laid out the harsh realities. In some meetings the people were given options to consider. In the meeting about Downtown there was only one ‘option’. For those who have options to consider they are facing either a buyout / relocation OR raising their house (if possible). And it doesn’t sound like they will have individual choice on this: the city is seeking the public’s input to make that choice. They need to choose an option that serves the needs of the community at large as well as reflects the will of majority of those in that area. So if the majority in an area goes for a buyout they will likely all get a buyout . . . and not everyone will be onside with that. In the North Ruckle meeting the engineer, Dobson, first showed a slide with all the houses marked with either a Green or red mark. Green meant that house didn’t get flooded and would not need to be raised (if that option was considered). Red meant that house would need to be raised. All the houses but one were Red. But a new dike would need a setback from the river of up to 20 meters in places and that single house would then be either in the way or in the river. So no houses in North Ruckle would escape the ‘choice’ . . . look at the screen grab below to see the tentative location of the dike they are proposing. And what might that choice be? Well they held a ‘straw poll’ of the 60+ people in the room with a show of hands of those who wanted a buyout. A large majority of them had their hands in the air . . . I hear that the South Ruckle meeting showed a similar sentiment. Naturally not everyone wants to leave their place – for many it’s been a good home in a community they cherish. But in the final decision which will be made by council it will be the will of the majority that will hold sway. And as councilor Thompson alluded to 70 minutes into the Questions part of the public meeting the city has powers they’d rather not use to deal with those who are recalcitrant. When you hear them talk relocation what they mean is a Buy-out and then relocation to somewhere within the city. That will be a major issue to overcome for our town. It will require using what available land there may be to create new housing opportunities for these displaced residents to move into. Which means working out how to stimulate construction of housing that isn’t prime because many of those who will be on the relocate list will not be shopping in the prime real estate listings because they won’t be able to afford ‘prime’. Why? Many of them are ‘retired’ people and wouldn’t likely qualify for a mortgage of any serious size. And while various city councilors are saying that they are suggesting that the buyout’s be done at fair ‘before the flood’ market value it will be up to people who don’t live here (meaning Victoria) to decide how those buyouts are calculated. So don’t be too surprised if the numbers fall somewhere between the before and after flood valuations. And that will mean those affected won’t be financially able to afford much of anything like they lost. This affects all of us who live and pay taxes here in Grand Forks. Every tax payer who leaves town or becomes a renter stops being an input on the tax rolls of the city. The major protective works will cost 10’s of millions of dollars. Those will hopefully be revenue neutral with funding support from the province and feds. But the fixed costs of the city, paying for the upkeep of its infrastructure and assets takes money. That money comes from taxes and utility rates. Those might both see a significant drop in numbers of paying customers. That means for those of us left the rates and taxes will go up. And if the fiscal picture gets grim there might be hard choices to make down the line regarding those assets and services the city has and provides. For Downtown the only option is Protective Works. 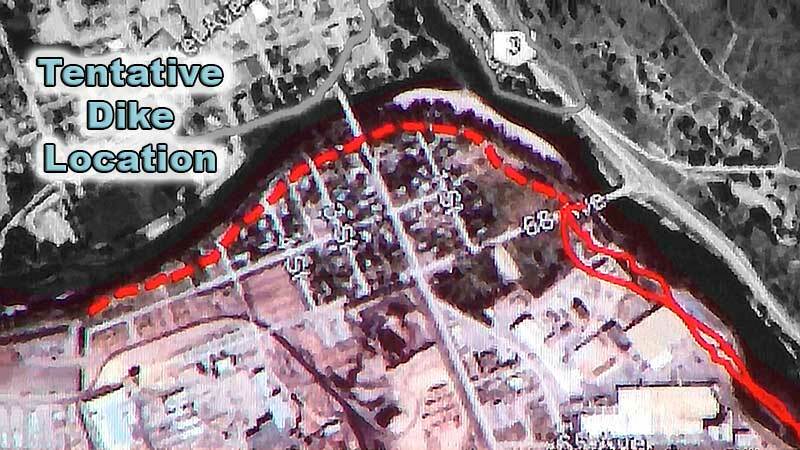 Part of that means a Dike, And while the actual location of that Dike hasn’t been decided just yet there is the distinct possibility that a number of dwellings along the river will be either destroyed or become cut-off and unusable. You can see that in the screen grab below. Some of that dike might entail raising the street and that becomes part of the dike. 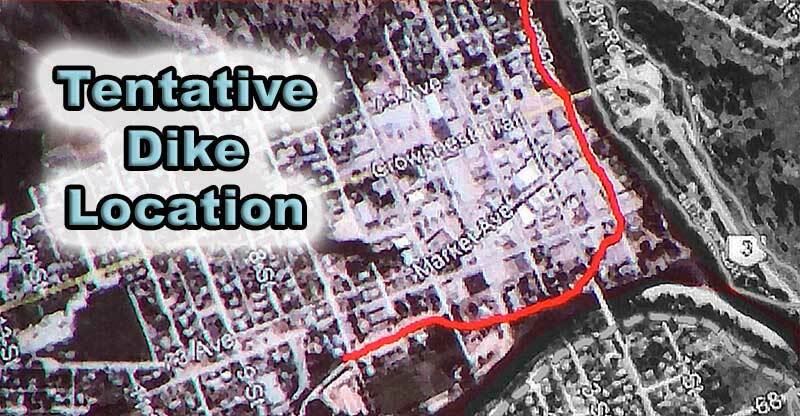 The other protective work that has been proposed, for downtown, is ground water mitigation. While overland flood has been a relatively infrequent occurrence downtown the same cannot be said for ground water rising and wetting basements and crawl spaces – that happens more often than not come spring time, So they’re finally going to put in a system to try and control that. In addition they will be working on gates and pumping to keep the storm drain system from becoming a means of ingress of the river flood waters into downtown streets and basements. The choice of which options will be made relatively quickly – within the next month. The answers are needed to calculate how much money the City will be asking of the Province. You’re going to hear the term ‘Ask’ a number of times in the meeting. Plainly speaking every major project that needs to be done will be cost too much for the City or Regional District to pay for on its own. So each becomes an Ask of a funding body outside the area – the Province or Feds. On Wednesday they held a public meeting in the auditorium at GFSS and publicly discussed most of what they had shown in the closed meetings. And faced questions. You can watch that below. I’ve broken the meeting into 3 parts: Introduction, Options and Questions. This entry was posted in City, government, Rebuilding Renewal and tagged buyouy, choices, dike, flood, options, recovery, relocate on August 9, 2018 by gftvboss.